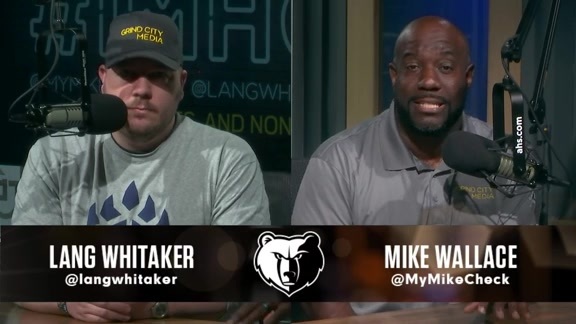 Grind City Media’s Alexis Morgan and Lang Whitaker break down the match against the Lakers. 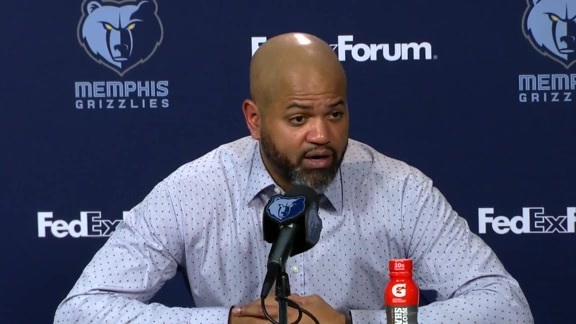 Listen to what coach Bickerstaff had to say following the Grizzlies match against the Lakers on Saturday night. 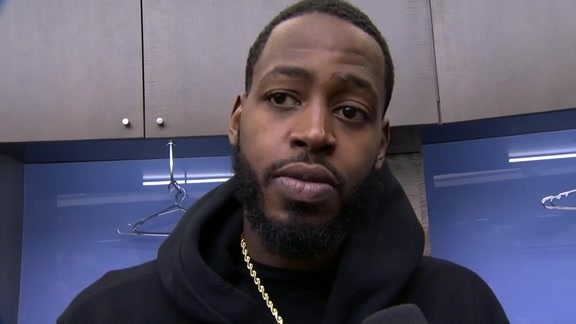 Grizzlies forward JaMychal Green talks with reporters following Saturday’s matchup against the Lakers. 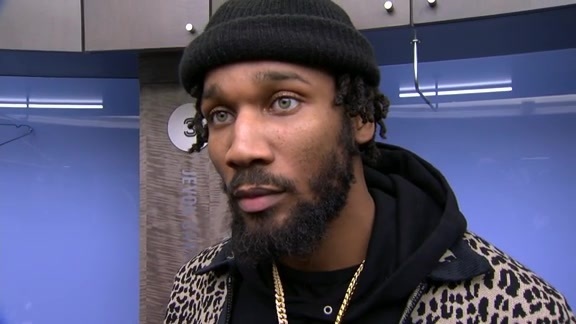 Wayne Selden shares his take on what happened during tonight’s game against the Lakers. 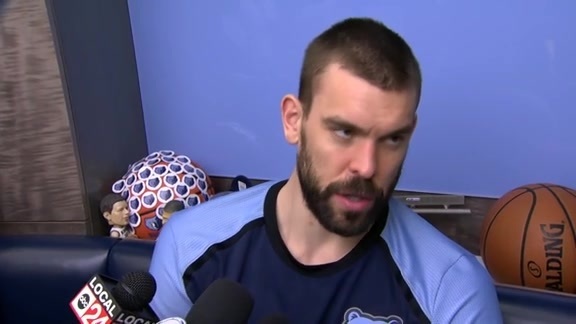 Grizzlies center Marc Gasol talks with reporters following Saturday’s matchup against the Lakers. 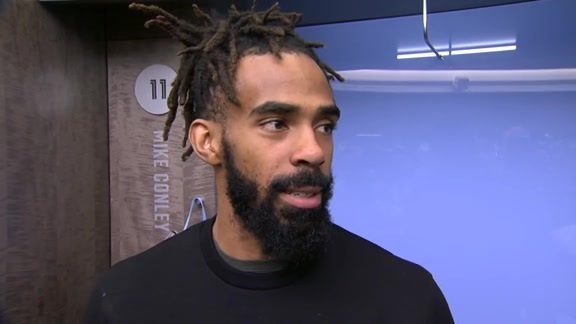 Mike Conley shares his take on what happened during tonight’s game against the Lakers. Check out all the highlights from tonight’s game against the Lakers in Memphis. Wayne Selden nets 17 points and 5 rebounds in the match against the Lakers. Selden drives to the rim and floats up a layup over the Lakers defenders. 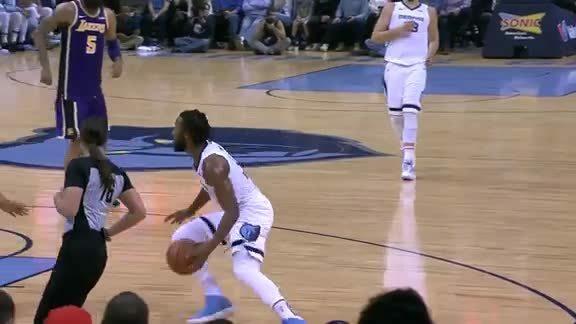 Jaren drains a three to start the game after the pick and pop with Garrett Temple. 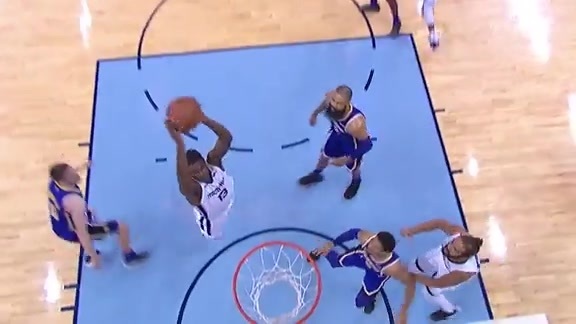 The rookie big man slams home a nasty two handed dunk. The Lakers’ outrebounded the Grizzlies 57-36 (+21). Los Angeles’ 19 offensive rebounds were a season-high for a Grizzlies opponent. The Lakers closed the first quarter with a 15-4 run over the last 4:52 to lead 27-16, and would lead for the rest of the game. Wayne Selden Jr. led the Grizzlies with a season-high 17 points on 7-of-12 (.583) shooting off the bench. It’s the first time this season that Selden Jr. has led the team in scoring. Mike Conley scored 12 points and Marc Gasol added 11. Jaren Jackson Jr. scored 11 points and grabbed a team-high eight rebounds. The Grizzlies shot 34-for-84 (.405) from the floor while the Lakers went 43-for-98 (.439). Memphis struggled from beyond the arc, going 6-of-30 (.200) from three-point range compared to Los Angeles making 16-of-41 (.390) threes. The Lakers dominated on the boards by outrebounding the Grizzlies 57-36 (+21), which included 19 offensive boards to the Grizzlies’ nine. That led to 20 second chance points for the Lakers and just six for the Grizzlies. 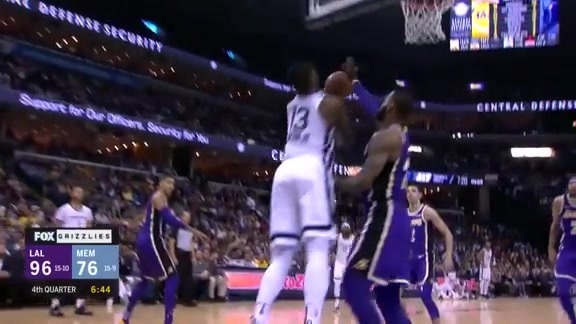 The Lakers’ 19 offensive rebounds were the most by a Grizzlies opponent this year. LeBron James flirted with a triple-double, scoring 20 points to go with eight rebounds and nine assists. Kyle Kuzma also scored 20 points and grabbed nine rebounds. Josh Hart and Kentavious Caldwell-Pope added 16 points. JaVale McGee logged a double-double with 10 points and 10 rebounds. Sviatoslav Mykhailuk had 11 points off the bench. In the first half, the difference was on the boards, where Los Angeles outrebounded Memphis 36-11. The Lakers pulled down 14 offensive rebounds (15 second chance points) compared to two for Memphis (no second chance points) to help lead 63-40 at halftime. Los Angeles opened the game by attacking the rim in the first quarter, scoring 14 of their 27 points in the paint. Even though they made just 1-of-8 (.125) three-pointers in the quarter, the Lakers still shot an efficient 12-of-25 (.480) from the floor. The Grizzlies struggled on offense, going just 7-of-24 (2-13 3P) in the opening quarter. Los Angeles outrebounded Memphis 19-6 during the period. The Lakers closed the quarter with a 15-4 run over the last 4:52 to lead 27-16. Memphis shot better in the second quarter, making 10-of-16 (.625) field goals. However, the Lakers offense continued their output by making 7-of-12 (.583) three-pointers in the quarter, the most threes the Grizzlies have given up in any quarter this season. Hart scored 14 points in the period by going 4-for-6 from three. Los Angeles continued to clean the glass, outrebounding Memphis 17-3 in the quarter. The second half was similar to the first as the Lakers continued to shoot the three well, making 8-of-21 (.381) treys in the half. Memphis made just 1-of-11 (.091) threes in the second half, tying a season-low. 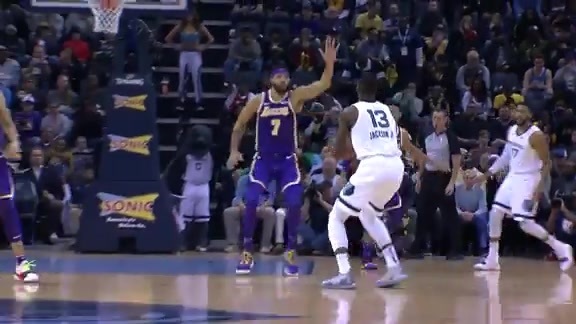 DJ Stephens checked in with 6:44 remaining in the game, marking his first NBA action since April 4, 2014 for the Milwaukee Bucks, and shortly after made an alley-oop dunk. The Grizzlies travel to challenge the Denver Nuggets on Monday, December 10 at 8 p.m. CT in Pepsi Center. Tune in to FOX Sports Southeast presented by Pinnacle Financial Partners or listen on 92.9 FM ESPN to follow the action. We’ve got to bounce back. We can’t play like this ever again this season. 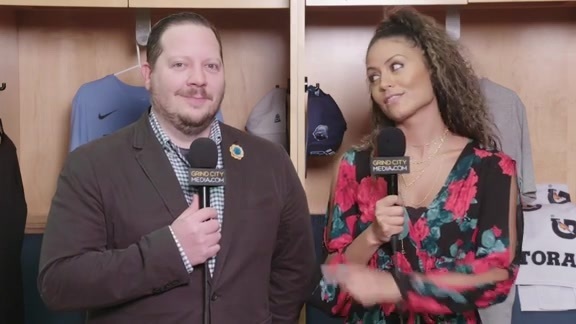 We had enough of those games last season, so we’ve got to get this out of our system. 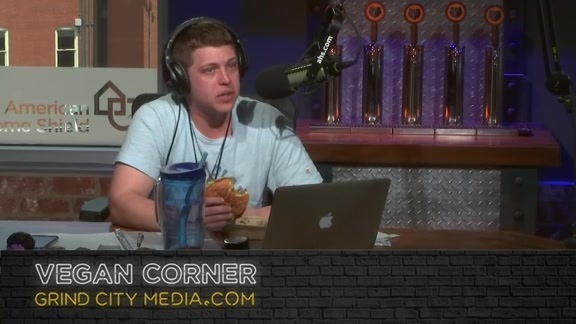 I think we just have to get back on the same page and figure it out defensively because tonight we weren’t really that good. Wayne Selden Jr. led the Grizzlies with 17 points on 7-of-12 (.583) shooting. It’s the first time this season that Selden Jr. has led the team in scoring. Mike Conley scored 12 points, the fifth time in the last six games he’s reached double figures. Marc Gasol had 11 points and six rebounds. Jaren Jackson Jr. scored 11 points and a grabbed a team-high eight boards. Tonight was the first time the rookie was a solo leader in rebounding. LeBron James flirted with a triple-double, scoring 20 points to go with eight rebounds and nine assists.